Your virtual reality panacea is going to take a little longer than expected. The Oculus Rift Kickstarter was a huge success, drawing in nearly ten times its goal of $250,000 and attracting support from industry luminaries including John Carmack, Gabe Newell and Cliff Bleszinski. That's good news; the bad news is that the unanticipated demand has thrown the production schedule into disarray. Oculus Rift development kits were initially supposed to be out to everyone in December, but the team announced today that they won't actually start shipping until March of next year. "When we launched our Kickstarter campaign in August, we hoped to sell a few hundred kits to game developers and virtual reality enthusiasts around the world. Instead, we were blown away by the overwhelming response from a community of almost 10,000 backers, who raised nearly $2.5 million dollars to help us develop the Oculus Rift," the latest Kickstarter update says. "Designing, sourcing, and manufacturing thousands of developer kits is no small feat. Since our Kickstarter, we've been up against the wall, working around the clock to produce and distribute over 7,500 units in just 4 short, crazy months. We've had to modify our original design for mass-manufacturing and, at the same time, balance additional features with our tight schedule." 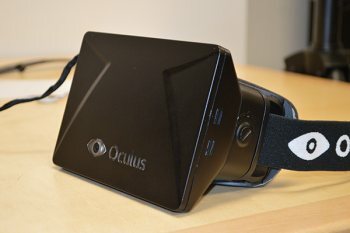 The Oculus team originally wanted to have the kits sent out to backers before the holidays but with the "required changes, new features, and manufacturing duration," that's not going to happen. Instead, the headsets will begin to shop in March 2013. In a nice touch, it didn't just toss out a new date but also offered a very detailed breakdown, complete with a colorful graph and several photos of the latest prototypes, of why it's been forced to push things back. Further Kickstarter updates providing more details about the hardware are promised for the next few weeks, and plans for the consumer version of the headset are also underway. Oculus Rift isn't the first Kickstarter project to suffer for its success: Shadowrun Returns was also pushed back from January 2013 to an estimated launch window of May or June.